"People often bake the sausage roll whole, then cut it up. But I've found that if you cut them into individual rounds first, the crispier results more than make up for the extra work. I like to eat mine dipped in a bit of mustard." Place ground pork, onions, garlic, sage, bread crumbs, salt, pepper, coriander, thyme, cayenne pepper, and nutmeg in a mixing bowl. Mix with a fork until ingredients are evenly distributed, 2 to 3 minutes. Divide mixture in half and place each half on a length of plastic wrap. 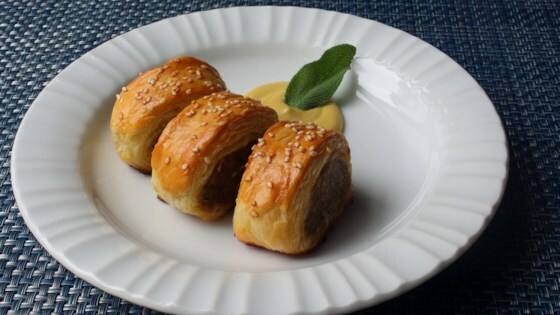 Use your damp fingers to shape each half into a cylinder, approximately the same length as the puff pastry. Roll up in the plastic and form into a round roll. Refrigerate until ready to use. Whisk egg with water to make the egg wash. Separate the semi-frozen puff pastry dough into thirds. Halve one of the thirds lengthwise. Bring pastry to room temperature. Brush a 2-inch strip of egg wash along 1 long edge of the 2 larger pastry pieces. Place the narrower pieces on the egg wash strip, overlapping about 1 inch, to make a wider piece of pastry dough. Press lightly to form 2 wide lengths of pastry dough. Transfer 2 sheets of dough to a lightly floured piece of parchment paper; dust tops lightly with flour. Cover with another sheet of parchment. Roll gently to achieve an even thickness. Remove top sheet of parchment. Flatten the longs edges of the dough slightly about 1 inch wide so that when the roll-up is completed, the seam side won't be thicker than the rest of the dough. Place a sausage log at the end of a pastry sheet. Begin to roll the sausage log in the pastry, brushing the far edge with egg wash before sealing the edges together. Place seam side down on parchment and place on a dish. Repeat with 2nd sausage roll. Freeze until dough firms up, about 10 minutes. Preheat oven to 375 degrees F (190 degrees C). Line a baking sheet with a silicone mat. Place rolls on a lightly floured surface. Lightly brush top and sides with egg wash. Cut each roll into 8 pieces. Sprinkle with sesame seeds. Place on prepared baking sheet seam side down (standing up). Lightly press each roll to flatten it slightly so they don't fall over when baking. Place in preheated oven; bake until nicely browned, pastry is cooked through, and bottoms are browned, about 30 minutes. One of Chef John's all-time favorite party foods! If time is tight, go ahead and just take some prepared sausage out of the casings, and use that, but by making your own, not only do you get to season it any way you want, but you also know exactly what you're eating. These were a great change to my football Sunday chips and dip. They were a huge hit and everyone loved them! These were delicious and remarkably easy to make. Will sure make them again! I’ve made this twice and they turned out great each time. Quick and easy to make and everyone loves them! Was easy to make however next time I make them I will make the pastry and meat into thirds rather than into 2 rolls as they were pretty large. A smaller bite is better for parties.